As I outlined in yesterday’s post, I’m heading to Louisiana to hang out with friends + family for a week. Frequent driving between Atlanta and various destinations across the US, including a few trips to Montana and beyond have yielded me a true road warrior. 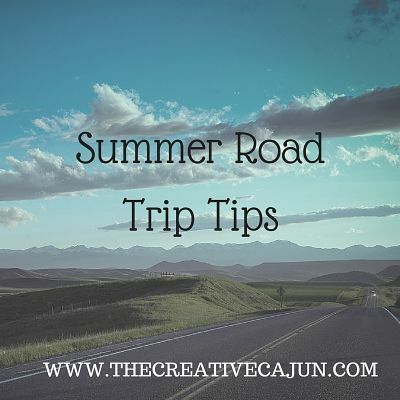 It occurred to me that a few of my road trip tips might come in handy for y’all, so I’m sharing them below. I hope you find them useful. I changed my diet a few years ago and I noticed how much energy I had once I removed sugar, processed foods and junk beverages from my daily diet. In order to stay as alert as possible, I have a no junk food rule when I’m driving. I used to load up on fast food, sugary drinks and candy – after all, I was on “Vacation” – why not live a little? Well, that can wait until you reach your destination. Driving while sleepy can be as dangerous as driving under the influence of alcohol or drugs, so play it safe and save the fun food for days where you’re not driving long distances. The sugary spikes from junk food makes me horribly sleepy, so I’ve learned watch what I eat on driving days. Start off the day with a good breakfast with protein and not too much sugar. I’ve weaned myself off of coffee with sugar (it took me a while, but surprisingly, I haven’t died of a sugar deficit yet), but I will indulge in a morning cup o’ joe. For snacks, I stick to nuts and protein (beef jerky, cheese sticks, etc) and water. I am amazed at how alert I can be during an all day drive if I don’t allow myself to have those drastic blood sugar slumps. While a batch of Meche’s donuts are always tempting when I leave Lafayette to return to Atlanta, I always decline the offer. I know if I were to have a bunch of donuts, I’d be exhausted within a few hours and have trouble staying awake. It’d probably hit me on the elevated span on the Atchafalaya basin bridge and that’s no stretch of road where you want to be drowsy….y’all know what I mean. I frowned upon audio books for a LONG time. I thought that was just my nerdy older sister’s hair-brained idea and I was too cool for that. I guess you can say I’ve joined the ranks of nerdy old ladies. Stick with me, though. I’m absolutely certain that there’s an audio book or podcast floating around out there that will interest you and your family. Do a bit of research on topics that interest you. I’ve found podcasts on everything from murder mystery series, backpacking + hiking tips and sewing information. With respect to audio books – your library likely has CD audio books available for checkout as well as downloadable audio books. I was thrilled when I realized I could digitally check out audio books from my library and play them from my phone or tablet device. Check with your library to see what they offer in terms of audio books – I think you’ll be pleasantly surprised. Back in the “old days” before smartphones – there was a book called “The Next Exit” that a friend with an RV told me about. It was like our travel bible – it went EVERYWHERE with us. It was a directory of every Interstate exit in the country + the facilities, restaurants, lodging, stores at that exit. Think of phone book, but for Interstate exits. With the expanded capability of smartphones, you’ll have all of this info available to you in real time in the palm of your hand and it’s best organized via one of the “Next Exit” smartphone apps. I have an Android and I downloaded the “Interstate Exit Guide”. I’m sure iOS users have a comparable app available. NOTICE: This is a task best outsourced to your navigator. Please don’t try to pull up the app as you are driving. Delegate this to a passenger navigator/helper. I hope these tips help you reach your destination in a happier and stress free travel experience. Road trips have been some of my most memorable experiences and I hope you’ll say the same about your summer road trips, too. Do you have a favorite podcast, audio book or road trip tip? Post them below! I love audio books for long trips too. They really make time fly by.